How Have Manufacturing Execution Systems Changed the Industry? Manufacturing execution systems (MES) have come a long way in the last few decades. A couple of decades ago, manufacturers used manufacturing resource planning (MRP) and enterprise resource planning (ERP) applications to manage data. However, those applications were limited compared to what MES can do today. Manufacturing companies not using MES today are behind in the times and could be making their systems and processes much easier. Those using MES using MES understand the benefits offered. MES has changed the industry and continues to evolve. Take a look at exactly how. The flaw with MRP and ERP is you can’t access real-time data to analyze. This is critical for the manufacturing business process, because you can see how a particular project is going and know how to manage inventory, supplies, maintenance and other factors. Having the ability to see what happened in the past few hours, what’s going on currently and what the projections are for the near future makes business process management much easier. Making business decisions based on projections alone are just as good as guesses. With manufacturing execution systems, you can take a lot of guesswork out of the equation. Being able to customize MES software makes it great for any manufacturing plant. If you want the system to focus more on inventory, you can do that. If you want it to focus only on a certain machine or a process, you can do that as well. This is a big positive when you have a machine that may not be functioning properly and you don’t know exactly why. 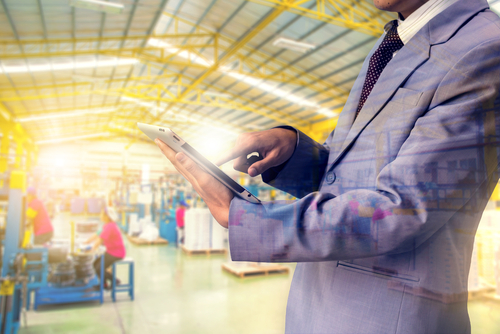 Manufacturing execution systems can give you enough information to identify what part of the process is causing problems, so it can be addressed accordingly. Accessing real-time data from anywhere can prevent downtime. With cloud based MES, you can view data from your mobile device virtually anywhere. You can also rest assured the data is kept securely in the cloud. Because of this mobility and flexibility, manufacturers using MES have a clear advantage over others not using MES. Reduced downtime means increased profits due to shorter processing times—and higher quality products as a result. Any business process management professional always looks for the most efficient way to go about business. Manufacturing execution systems have changed the industry over the last few decades, and will continue to do so in the future as it evolves even further. For more information about how MES can be tailored to your company, feel free to contact us.